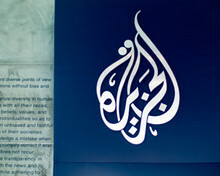 Al Jazeera's broadcast signal across the Arab region is facing interference on a record level, according to an announcement by the broadcaster. The network said that it has faced "multiple attempts" to disrupt its coverage from Egypt, "with signals being interfered with on a continual basis, and journalists being banned and detained." "We have been working round the clock to make sure we are broadcasting on alternative frequencies," an Al Jazeera spokesman said. The Qatar-based broadcaster reported at the weekend that its Cairo bureau had been closed down and its licence to broadcast in Egypt revoked following its coverage of anti-government protests in the country. Internet connections within Egypt appear to have been restored this morning, according to reports, after many in the country experienced days of being cut off. To overcome the internet blackout and restrictions on its journalists, Al Jazeera was publishing audio messages from its correspondents in Egypt, powered by live-blogging platform ScribbleLive. On Saturday, ScribbleLive set up a phone number which would enable reporters and web producers from Al Jazeera to call in and leave recorded messages, to be later posted on the audio message platform. ScribbleLive's Mark Walker told Journalism.co.uk that the idea had resulted in "really compelling content". "This was the first time somebody has used it in such a critical way, in a way that was a significant breakthrough against censorship and oppression. "We've never had a news organisation using it in the way that they [Al Jazeera] are." A spokesman for Al Jazeera gave credit to the television channels that stepped in to try and keep it on the air.